The Hyatt Regency Washington on Capitol Hill offers inviting accommodations and gracious service in an unparalleled location in the heart of the city. This hotel is ideally located just steps away from the Capitol Building and the city’s historic sights. Make Washington DC your home away from home in spacious, modern guest rooms with plush amenities. 400 New Jersey Ave, N.W. 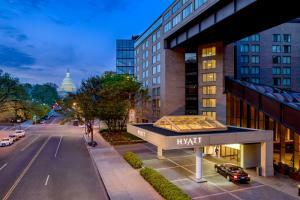 Located in Washington, D.C., just steps away from Verizon Center, monuments, and museums. Article One - American Grill. Smithsonian Museums, Air & Space Museum, Natural History Museum, Washington Monument, Lincoln Memorial, National Gallery of Art.